National Parks are a great thing and the United States of America has an incredible number of these parks. Something in the neighborhood of 348, I think. The thing is, I don't think anyone knows that they're not just open in the summer, but year-round. It's hard to match the feeling of having Delicate Arch, in Arches National Park, all to yourself on a brisk winter morning. 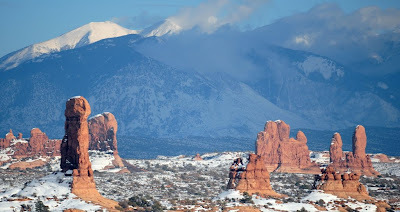 This was my third visit to Arches, but my first time really paying any attention to the La Sal Mountains off to the southeast. I like what I see. I proposed to Rachel at delicate arch. We had it all to ourselves to watch the sun set in late February. Beautiful. It's been a while since I've had an experience like that (and I'm not talking about the proposal) - I'm envious of (but excited for) you that you're taking the time to soak in the beauty. There's a lot of it out there. Say hi to it for me. Roboto, that's some quality proposal steez you got there. Good work. The beauty says hi and it misses you.